A prenuptial agreement (also known as a premarital agreement) is a contract entered into between two people who are about to be married. The contract defines their duties and obligations should their marriage end. Why should I enter into a Prenuptial Agreement? If you get a divorce in California, the Courts will automatically apply community property law to divide your assets and debts. Generally, this means that everything you acquire during marriage will be equally divided between you and your spouse should you get a divorce. In some cases, equally dividing your assets upon a divorce may not be the most equitable option. In these cases, some people prefer to enter into an agreement with their future spouses on how to divide their assets and debts should their marriage end in a divorce. If you prefer to enter into an agreement with your future spouse regarding the division of your assets and debts in the case of divorce, call our office to speak with an experienced family law attorney to discuss your options. I want a very basic prenuptial agreement. Do I need an attorney to draft this for me? Yes, we highly recommend that you have an attorney draft your prenuptial agreement for you no matter how simple the terms may be. 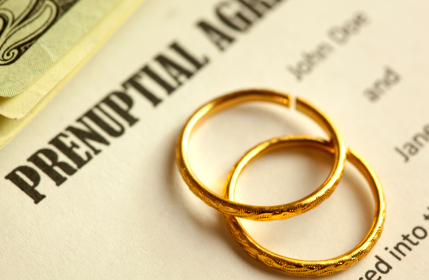 In order for a prenuptial agreement to be upheld and valid it must meet certain requirements. A qualified family law attorney can explain all the criteria required to craft the appropriate prenuptial agreement for you. My future spouse has asked me to sign a prenuptial agreement. Do I need to review it with an attorney before I sign it? Yes, you should absolutely review a prenuptial agreement with an attorney before signing it. Your attorney should explain exactly what you are agreeing to, what your rights and obligations are under the prenuptial agreement, what rights you may be waiving in the prenuptial agreement, and whether the prenuptial agreement is fair. The ultimate decision as to whether or not you sign the prenuptial agreement is yours, but you should thoroughly understand the prenuptial agreement and know what you are agreeing to and what you may be giving up before you agree to it. Whether you are the one who will draft the prenuptial agreement or review the prenuptial agreement. Can we agree to who will have custody of our kids in our prenuptial agreement if we were to get a divorce? No. Any provision in a prenuptial agreement that deals with custody of your children will not be upheld as valid in Court. Can we agree to the amount of child support I will pay/receive in our prenuptial agreement if we were to get a divorce? No. Any provision in a prenuptial agreement that deals with child support for your children will not be upheld as valid in Court. Can we determine the amount of spousal support that I will pay/receive in our prenuptial agreement if we were to get a divorce? You can address spousal support in your prenuptial agreement. However, whether or not this provision will be upheld in Court depends on several factors. To discuss your specific situation, call our office at (949) 391-3118 to speak with an experienced family law attorney. A Postnuptial Agreement is a contract entered into between a Husband and Wife during marriage. The Postnuptial Agreement defines the rights and responsibilities of the couple during and after the marriage. There are several factors that must be present in order for the Postnuptial Agreement to be valid and enforceable. Farkhad & Wang can represent one spouse during the negotiations and assist in the drafting of the Postnuptial Agreement. If you are in need of a Postnuptial Agreement, or if you are presented with one, we encourage you to call our office for a consultation.